Don’t Replace it… Refinish it! 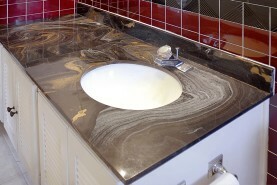 Is your bathtub or vanity made of cultured marble? Refinishing is a process that can make dated colors, swirls, cracks and scratches all disappear. Miracle Method’s cultured marble refinishing process will save you up to 75% over the cost of removal and replacement, and typically takes just one day. Refinishing updated the look of this cultured marble vanity! Miracle Method’s MM-4 bonding agent assures you that the new surface will stick for many years to come. Many of our competitors will not offer cultured marble refinishing, nor offer a guarantee, because their acid etching process will dissolve the surface of cultured marble. Miracle Method can guarantee your refinished cultured marble finish because of our proprietary bonding agent, MM-4. 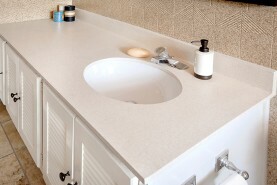 Our process works equally well on cultured marble vanities and sinks allowing you to complete a bathroom makeover by refinishing your bathtub, surround, vanity and sink. If you are considering replacing or refinishing your cultured marble bathtub or vanity, click on Find a Location or call our toll free locator number, 1-888-271-7690, to reach the nearest Miracle Method professional.